Minister of Foreign Affairs of St. Kitts and Nevis, Honourable Mark Brantley, (left) signs a mutual visa agreement with His Excellency, Dr. Mamadou Tangara Minister of Foreign Affairs, International Cooperation and Gambians Abroad. BASSETERRE, St. Kitts — In a much anticipated move to strengthen diplomatic relations with The Gambia, Minister of Foreign Affairs of St. Kitts and Nevis, Honourable Mark Brantley, and His Excellency, Dr. Mamadou Tangara, Minister of Foreign Affairs, International Cooperation and Gambians Abroad, agreed to waive visa requirements for entry into both countries by their nationals. Both ministers discussed the potential that can be harnessed if the African and Caribbean regions collaborate and strengthen ties. Connected by history and ancestry, the visa waiver agreement is a demonstration of the desire to systematically dismantle the barriers to the movement of people between both countries and our regions. 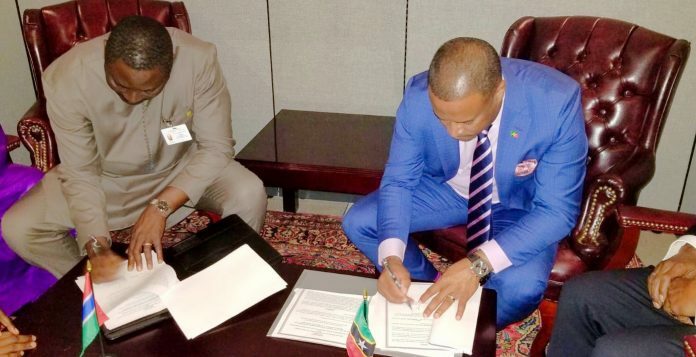 The mutual cooperation between St. Kitts and Nevis and The Gambia will focus on climate change, migration, health and other issues of common and beneficial interests. Minister Brantley conveyed special appreciation to the Government of The Gambia for its interest in deepening bilateral relations.